Oxidative chemical nucleases represent an important class of synthetic compound that mediate nucleic acid recognition and strand scission. These agents have found utility as footprinting probes to map drug–DNA and protein–DNA interactions and also as clinical cytotoxins of human cancer. 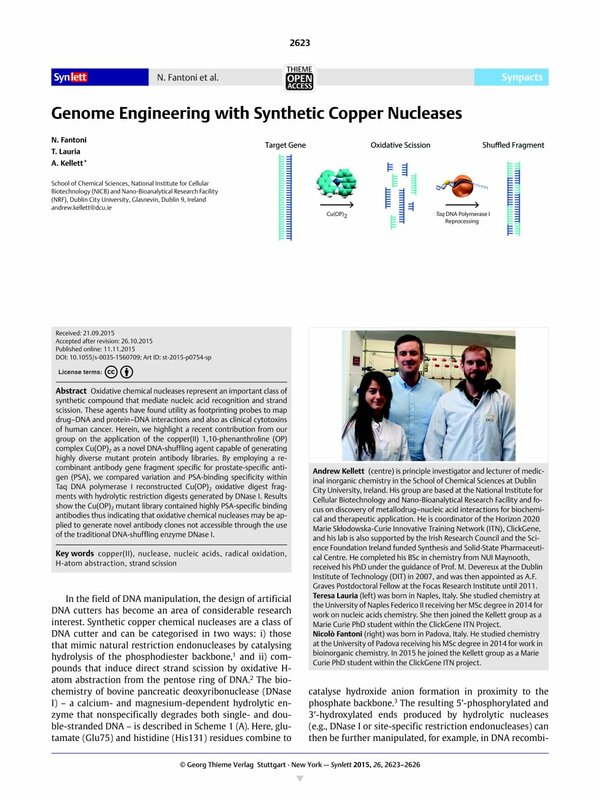 Herein, we highlight a recent contribution from our group on the application of the copper(II) 1,10-phenanthroline (OP) complex Cu(OP)2 as a novel DNA-shuffling agent capable of generating highly diverse mutant protein antibody libraries. By employing a recombinant antibody gene fragment specific for prostate-specific antigen (PSA), we compared variation and PSA-binding specificity within Taq DNA polymerase I reconstructed Cu(OP)2 oxidative digest fragments with hydrolytic restriction digests generated by DNase I. Results show the Cu(OP)2 mutant library contained highly PSA-specific binding antibodies thus indicating that oxidative chemical nucleases may be applied to generate novel antibody clones not accessible through the use of the traditional DNA-shuffling enzyme DNase I.